As we age, our physical abilities change. One day you’re taking stairs two at a time, the next it’s a pain to go up even a dozen. Those challenges are amplified if you’re in a house that wasn’t designed with those capabilities in mind. The choice to remain in a home that you have loved for decades but no longer meets your physical needs can be incredibly tough. Luckily, there are more options for aging in place than ever before. Updating a bathroom or kitchen for easier aging in place is more than just installing new countertops or shelves. It can mean a new oven where all of the buttons are on the front so it’s accessible from a lower height, or installing a microwave that’s built into the central island. Even just adjusting the height of all of the light switches or plugs can make a major difference. For Aquilino, all of the houses they build come standard with some basic adjustments to make life just that much easier. “All of the doors are 36 inches. The bathroom door: it opens out, not in. The width around the island is wide enough that a wheelchair can navigate it easily. There are outlets at the bottom and top of the stairs so it’s easy to put a chairlift in,” Aquilino pointed out. 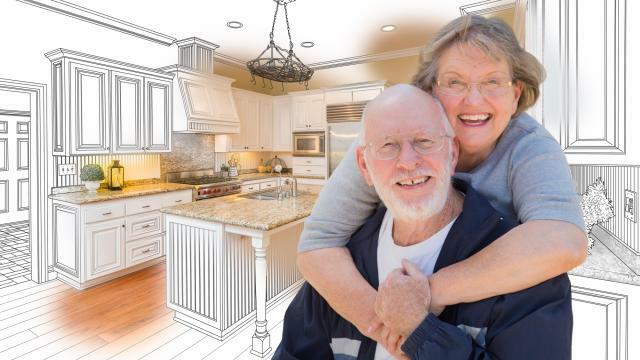 Renovating homes that weren’t built with aging in place in mind can be prohibitively expensive. Multi-floor homes might require the introduction of an elevator, a cost Aquilino estimates can reach $75,000. Smaller renovations, like installing a walk-in shower or updating the garage entry so it doesn’t include steps, are more cost-effective but may not address every issue. When it comes down to choosing a home for aging residents, quality of health should be one of the most important factors. It’s not enough to just know these changes are coming, it is important to discuss them and have a plan. If an accident occurs or if needs change over time as they age, what does the senior want and what options are financially viable? Having the discussion is one thing, but knowing all of the options is another. Instead of guessing how much a renovation would cost, get an estimate. Learn more about caregivers in the area, what services they provide as well as what you can afford. Getting unbiased and knowledgeable professional guidance is critical to ensuring a fully informed living location decision is made. Updating a home or relocating to a new living situation can be daunting, but experts are available to help you make an informed choice. Being proactive can minimize both the financial and emotional stresses and ensure that your senior life is healthy, safe and enjoyable. Next PostNext What Should I Know About Universal Design and Remodeling My Bathroom?